Before reading this chapter, think of a powerful memory in your life and ask yourself whether this memory still affects you. Is it still a present reality? Share this experience with friends. 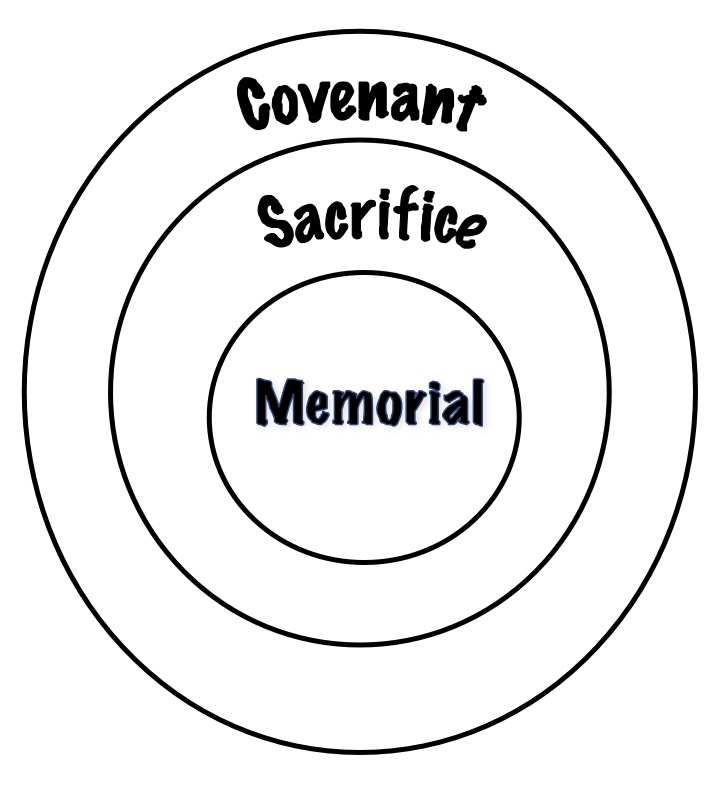 Covenant, sacrifice and memorial are very closely linked. We can show this by having three concentric circles. Covenant is the outermost circle, sacrifice the middle circle and memorial the innermost circle. The most important event in the history of Israel was the deliverance from slavery in Egypt, described in the book of Exodus. In spite of the many plagues that occurred in Egypt, Pharaoh would not allow the Israelites to go. What finally persuaded him to allow their departure was the death of all the first-born in the country. The way the story is told (and we have to allow for the fact that these were originally camp fire stories and pre-Christian), ‘the angel of death’ came one night and struck down all the first-born. However, the angel ‘passed over’ the homes of the Israelites because they had smeared their door posts with the blood of a lamb as instructed by Moses. In the final meal that the Israelites ate before they departed, the lamb was to be eaten with unleavened bread and bitter herbs (Exodus 12:9), and when they came into the promised land they were to remember this wonderful event with a similar meal. This Passover meal, Paschal meal or Seder meal, is still celebrated by the Jews in memory of the deliverance from Egypt. The memories are made more powerful by having symbols of that momentous event: bitter herbs, salt water and egg as I have described in Chapter 8: The Abiding Presence. When the Jews celebrate this meal they bring God’s action into the present by asking for deliverance from whatever is harming their communities right now. By doing this they are not just remembering an event of thousands of years ago. Deliverance is a present experience; it is happening now. In our Western culture to remember is to look back over our shoulder at something in the past and leave it there. I’ve been told that for the Maoris of New Zealand, to think of their ancestors is to see them in front of you as in a mirror. And as I understand it, the Dreaming of the indigenous Australians brings the creation myths of the ancient past into the present reality. For Kenyans, memory is a window into the past. Take this, all of you, and eat of it, for this is my Body which will be given up for you. No longer would Jesus’ followers celebrate the meal in memory of the escape from slavery in Egypt. They would celebrate this meal in memory of Jesus who freed them from the slavery of sin. When we celebrate the Eucharist with bread and wine we remember how Jesus gave his body and blood, the totality of himself, ‘so that sins may be forgiven’, so that we are delivered from slavery to practices that are offensive to God, offensive to ourselves and offensive to others. These offensive activities are a present reality in our lives: selfishness that puts ourselves before others, arrogance that boosts our egos, refusal to share our wealth, compulsive addictions to alcohol and drugs and so on. When we participate fully in the Eucharist we bring the death and resurrection of Jesus into this present sinful situation and we ask to be delivered from it. This is the awesome power of this kind of remembering. This memorial meal is a rainbow with one end in the death and resurrection of Jesus 2000 years ago, arching over the centuries and coming to rest in the present moment. The pot of gold that we find at the end of the rainbow is the forgiving and transforming power of the risen Christ, made available to us through the Eucharist. It can help us overcome our innate selfishness and other failings. The Eucharist helps us to manage our lives. Not only does the Paschal meal allow the Jews to enter into sacred time and bring a past event into the present, it also incorporates the future because they always look forward to celebrating ‘next year in Jerusalem’. We look forward to celebrating the fullness of this meal in the heavenly banquet. Sacred events collapse past, present and future into one mysterious now. At Mass we need to be sensitive to this experience of timelessness. Past, present and future have merged into one eternal moment. Therefore, O Lord, as we now celebrate the memorial of our redemption, we remember Christ’s Death, and his descent to the realm of the dead, we proclaim his Resurrection and his Ascension to your right hand, and as we await his coming in glory, we offer you his Body and Blood, the sacrifice acceptable to you which brings salvation to the whole world. This juxtaposes very beautifully the past (the Christ event of 2000 years ago), the present (this celebration) and the future (Christ’s coming again). Remembrance in liturgy is also remembrance by doing, by performing actions, not just by mental recall. It includes doing what Jesus did at the Last Supper with the bread and wine, that is, taking, blessing, breaking, sharing. Through the priest who represents us, we do what Jesus did. Thus, within the liturgy of the Eucharist, in the Preparation of the Gifts, in the Eucharistic Prayer, in sharing the hallowed bread and wine, we do what Jesus did. To this we add the liturgy of the Word, in which in another way – the way the words are spoken, heard and heeded – we remember and make our own all that Jesus has done, is doing, and will do, to change us for the better. Indeed, the Eucharist is our basic spirituality. Let us make full use of it.